I groaned on the inside at the request. One of our family traditions for birthdays is to allow the birthday boy or girl to pick an activity of choice. I felt bad for feeling so unenthusiastic about his choice, but there were several good reasons I wanted to deny his request. Morning sickness and an upcoming move were among them. But instead, we chose to honor him by saying yes and finding the time to do this activity as a family. I’ve found that it’s far too easy for me to let the busyness of life take control of my day and not remain intentional in our relationships. Sometimes it’s just my lack of energy or selfishness that makes me want to say no to even simple requests. I believe that each of my children are a unique blessing in my life and deserve my respect and value. If I expect my children to be able to honor me, then I have to be able to model it myself. 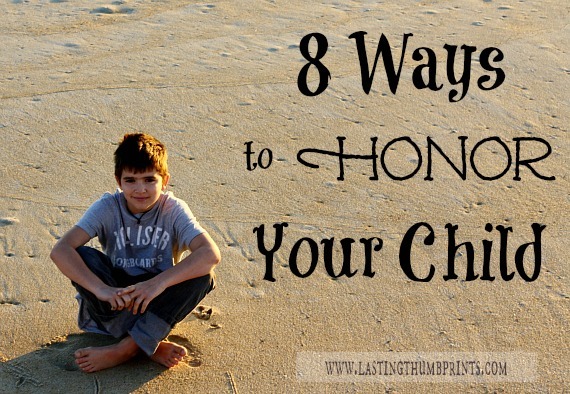 So what does it look like to honor our children? Here are eight ways all parents can start. And my guess is that you’re already doing many of these things. In order to gain a solid understanding of any subject, we have to study it. The same goes for any good relationship, including our children. We need to understand what makes each of our children tick in order to meet their needs well. What type of personality does she have? Which learning style seems to work best for her? If we don’t take the time to learn who they are, then we will all suffer frustration and misunderstanding. A great place to start understanding your child better is with the book The Five Love Languages of a Child. Take a genuine interest in what your child is passionate about. Spending 30 minutes to play a video game with your child may sound like torture, but taking the time to learn about and share in your child’s interests will go a long way to developing a strong relationship. Have a tea party. Play cowboys. Watch the 500th remake of a Lego stop motion video your child has been creating with a smile on your face. Show your child that the things he likes are important to you. Don’t trivialize or dismiss the way that your child feels. Handle their feelings seriously and with care. Don’t make jokes or belittle them. Let your children know that how they feel is important to you. Share in their joy and excitement. Hold their hands through discouragement and disappointment. Be their biggest cheerleader and their biggest champion! If your child has a reasonable request, find a way to say yes. Don’t let inconvenience rob you and your child of opportunities to build your relationship and create memories. There are plenty of times we have to say no as parents, so be on the lookout for ways that you can say yes. Our children need to believe what we say to them. If you want your child to trust you, don’t make a habit of breaking your word. I know I’m guilty of saying, “In a minute, sweetie”, and it taking much longer than that to give my attention. Being consistent is also really important. Be willing to acknowledge when you are wrong. Apologize, seek their forgiveness, and pray together. This will not only strengthen your relationship with your child, but will teach your child the right way to reconcile with others. Be engaged when you are with your children. Ask questions. Look your children in the eyes when you talk with them. Turn off your phone or at least set a phone free time at meals. Our children need to know that we are listening and they have our full attention. Share in your children’s accomplishments, no matter how big or small. Even if it’s just a high five and a big smile. Let’s be honest, we all like affirmation and children need it too. Speak words of life over your children. Remember to tell your children that you are glad they were born and that you like the way God made them. As we purposefully choose to do these things, we are not only building strong relationships with our children but providing a model for them to follow in the future as they make relationships with others. These are the things that build our legacy as parents. This post was first published on April 12, 2013. One way my husband and I honor our children is this; Over the years you sell many things they have outgrown. Much of them are gifts from holidays such as birthdays and Christmas. When a larger ticket item was given as a gift and later sold we got the best reasonable price and then gave the amount received to the child owning the item. After all, the gift was theirs so the sale of the item, however used, goes back to the owner. Another is taste in style. Both of our children wanted gradient blue hair (hombre) over the summer. It comes to about $280 per child at a salon. That was out of the question but my husband and I equally spent 5-7 hours per child with a few kits of Splat Hair Dye and made it happen. I really love having done that with them, together. So many examples there! This is so good. I find myself getting frustrated with my children when they do not express emotions like I wish they could, and sometimes react in ways that are contrary to what they need. Thank you for this! 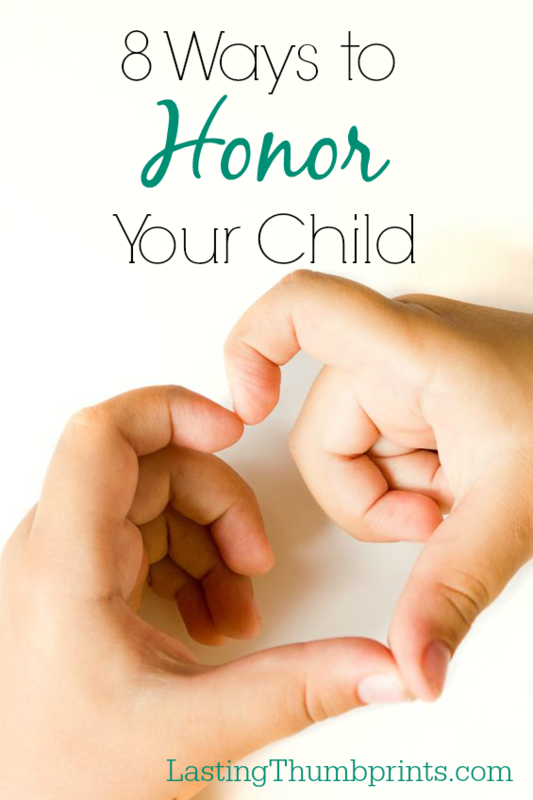 Honoring your children is one of the powerful ways you can put an end to verbal assaults.